During the recent IAAPA Attractions Expo in Orlando, Alberto Zamperla introduced new products from the company’s Z+ brand, including the Bump Arcade. Zamperla’s Z+ is reinventing the game with interactive bumper cars. Bumper cars for adult and kids alike are one of the most iconic, popular, and long-lasting amusement park rides out there. Z+ had the innovative idea of bringing something new to the ride with the aim of refreshing it and offering an immersive gaming experience. It gives a brand-new experience to a classic ride, a way to bump and swerve guests’ way to points. Spot the projections on the floor and drive over them to gain points. There are a variety of projections available. It represents a small investment to refresh a classic ride. Zamperla’s Z+ is also offering the VR Box, the first six dimensional, suspended simulator that incorporates VR content. It is the result of a frequently asked question by operators of small parks and indoor FECs as to how they can offer their customers a “big coaster” experience when they don’t have the space or budget to do so. Now they can answer that question with the VR Box. 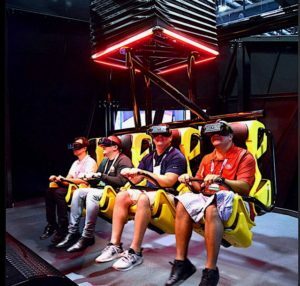 VR Box has the capacity of eight riders on two rows of four suspended seats who will enjoy a genuine coaster experience. In fact, the VR headsets display real videos of roller coasters shot by 360° cameras. This sensation is enhanced by real audio recorded on site and wind machines within the product. The VR Box offers many other possibilities too, such as 360° journeys around real cities or CGI animation with endless applications. Possibilities are endless due to the VR Box’s ability to adapt in any setting; thus, making it a perfect fit for everyone from parks, FECs, and museums to non-traditional entertainment facilities. To complete the new ride, Z+ offers a range of different outer shells designed to attract visitors with their cool, eye-catching shapes and lighting packages.